Our page on Madrid webcams enables you show you live pictures and views of Madrid, the capital city of Spain. A Madrid webcam is simply a camera connected to a computer which in turn is connected to the Internet. Sometimes these are also referred to as Madrid cams or cams of Madrid. A popular weekend break destination, the main appeal lies in the historic buildings and architecture such as the Puerta del Sol and Plaza Mayor. This is also a fabulous place for people-watching, just sitting outside cafes or bar hopping or going clubbing. Why not catch a football match at the Santiago Bernabéu Stadium, home of perhaps the most famous football club in the world – Real Madrid. For culture and art visit the Prado museum and see Picasso’s famous ‘Guernica’ exhibited. The traditional Spanish bullfighting still continues at Spain’s largest bullring, Las Ventas and the best time is when the annual San Isidro festival is on. The flamenco dancing is another famous Spanish tradition that can be seen in Madrid. These Madrid webcams beam images of Madrid twenty-four hours a day so that you can see Madrid from your computer wherever you are in the world. Below we have a list of available Madrid webcams. Just click on the links to see live webcams of Madrid. 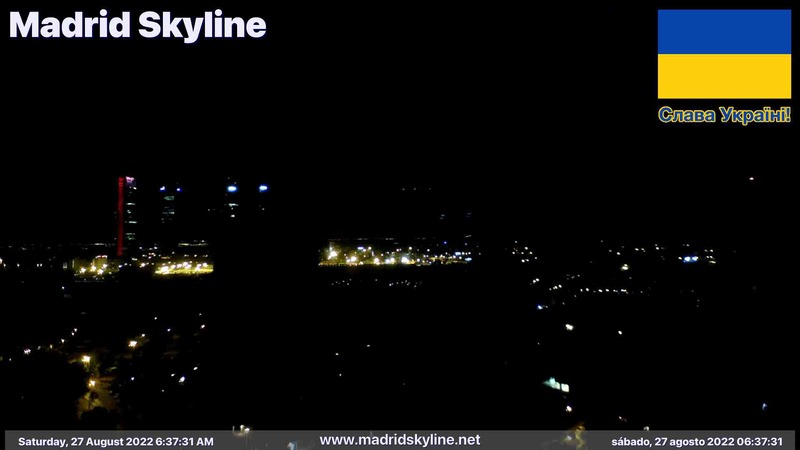 This Madrid webcam shows the skyline of Madrid. The camera is looking at Chamartín railway station and the Cuatro Torres Business Area. This includes Torre Caja de Madrid, the tallest building in Spain at 250 metres (820ft) high. City View of Madrid – Great views over the urban skyline of Madrid. As well as our webcams showing pictures and images of Madrid we also have an useful Madrid tourist information video below showing the most famous sights, best attractions and notable landmarks in Madrid. Madrid Webcams Page Summary: If you have never been to Madrid and want to see what Madrid looks like then Madrid webcams are ideal to get a flavour of Madrid.